Shipping $11.84 Add item to cart for shipping estimate. You can SAVE on shipping by buying multiple items from the same seller. Shipping is charged by each individual seller. Sellers at times may also provide FREE SHIPPING on select items or on entire order if it meets the minimum order value. Please check sellers page for more details. 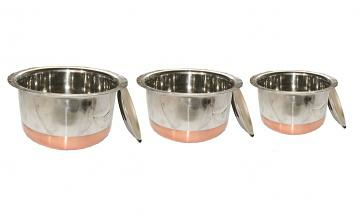 COPPER STEEL STOCK POT , SET OF 3 WITH LID. IDEAL FOR BOILING MILK OR DOING HEAVY COOKING. This multi purpose topia is made from heavy duty stainless steel and has copper bottom on the outside. It is ideal for any type of cooking like stir-frying, curries and vegetable dishes. Works with any type of heat source and distributed heat evenly. Easy to clean. Shipping Cost $11.84 Buy multiple items online from Indian Root to SAVE on shipping. Buy Copper Steel Stock Pot / Cooking Patila 3 Size Set, sold & shipped by Indian Root where you can shop online for Exclusive Collection of Ethnic Indian Gift & Home Decor Item. This Stainless Steel Cookware collection has been tagged as stainless steel patila, topia, indian cookware, cooking utensil, sauce pan, copper vessel.